FISH307.com Has Partnered With Michigan Stinger To Offer You Every Spoon In All Sizes & Patterns That Stinger Makes. Michigan Stinger has set a very high standard for Big Water spoons. Michigan Stinger's Scorpion spoons, Standard spoons, Stingray spoons or Magnum spoons are real walleye killers. With top quality construction Michigan Stinger spoons are among the most popular for walleye, steelhead and salmon fisherman, whether fishing Lake Erie, Lake Michigan, Lake Ontario or anywhere in between! Michigan Stinger spoons have become very popular trolling spoons and consistent producers on the Great Lakes and elsewhere. The Magnum is the largest of the Stinger line (4-3/4") targets Salmon and Trout. However, it has been a proven winner for Pike, Stripers and other large fresh and saltwater predators. Excellent speed forgiveness and comes in the complete Stinger color selection. The Stingray size Michigan Stinger was new for 2005 and was developed to target cold water species. This is the largest of the Stinger series of spoons, designed for big water and large fish, including Walleye and Stripers. 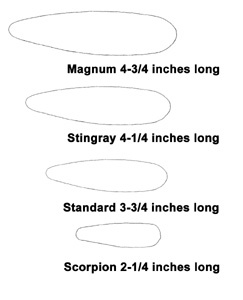 The Stinger Standard size Michigan Stinger was developed to target cold water species. However, they have proven to be very effective on many other species, including Walleye and Stripers. As with the entire product line, incredible speed forgiveness has been engineered in. The Scorpions are the smaller version of the Michigan Stinger spoons. We carry the Lightweight model which is primarily designed for trolling & the 1/2 ounce model which is perfect for casting & jigging. Originally designed for Walleye, they also have gained tremendous popularity with the Trout and Salmon anglers. They are also proven effective in the spring for Browns and Coho off planer boards, as a slider off downriggers, or any time small baitfish are encountered. This spoon breaks all the rules with regard to the old saying "Big bait - Big Fish". The fact is large predators often feed on very small prey, and find these spoons irresistible.